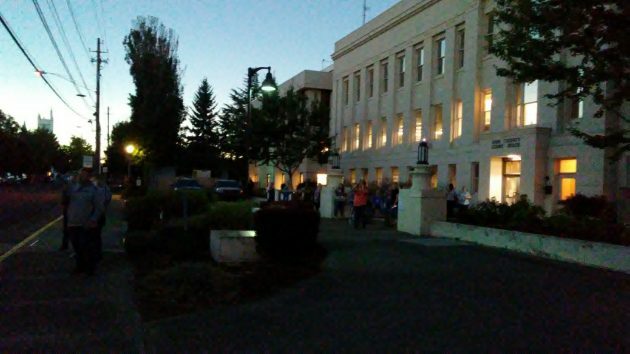 People gathered in the dark outside the south entrance of the Linn County Courthouse during Monday’s total eclipse. So have we learned anything from the Great American Eclipse on Monday? I don’t mean in a scientific sense but as news consumers and participants in public events? One thing some of us have learned, or relearned maybe, is to be a bit more skeptical of government advice and warnings. For weeks ahead of the big event, state and local agencies were telling people to stock up on food and fuel because the crush of visitors to Oregon would deplete supplies and traffic jams would make it hard to get around. It didn’t happen, obviously. Local streets were all but deserted during the eclipse. Afterwards, as tourists were trying to get home, a few major highways were clogged for a while. But there was never any difficulty getting around our towns before, during or after the eclipse. Hospitals and other organizations might be less worried about their ability to function the next time there’s a short period of time when the sun hides behind the moon. So there’s no need to cancel surgeries or set aside emergency shelters for staff members unable to commute. The local trash service shifted its pickup schedule by one day, extending into Saturday, because of the eclipse. That turned to be unnecessary, except as a way to give employees a chance to sit and watch the sky with everybody else. Chances are, however, that the experience of Monday won’t do anybody any good. Nobody will remember it by the time the next total eclipse is visible in these parts. As I understand it, the next total eclipse visible in any part of the United States will come on April 8, 2024, but we won’t see it here as it slices across the nation from Texas to the Northeast. We won’t see the next one after that either, those of us still alive. It will happen on Aug. 12, 2045, and be visible from Northern California to Florida. Can you over-prepare for potential serious problems? I would much rather do so than being over-complacent. The process involved for the planning of it was very good for all entities involved IMO..
What I’ll remember is on Sunday afternoon, the day before the eclipse there were more people walking around Downtown Albany than at Costco. Most downtown businesses closed and the Carousel closed at their new Sunday hours of 3pm. We brought my nephew from Seattle and his family downtown to see the carousel and it was so crowded that we couldn’t catch a ride. So many people downtown and so few shops open to take advantage..a missed opportunity. The few shops and restaurants that were open were packed! Sorry Hasso, but have you considered that the reason why we didn’t have any problems was because we were prepared? “Prepare for the worst, hope for the best!” wins again. Reactionaries like Hering love to point to what they perceive as unnecessary preparations for events such as the eclipse. Yet, these same Reactionaries say nothing when there is a failure, except to blame the government for failing to anticipate and plan accordingly. It is nearly impossible to defeat Reactionary thinking for the simple reason that Reactionaries only react and they play both ends against the middle. A strategy that never seems to fail. They do not take positive, cautionary steps ahead of time because it is so much easier to make light of the good faith efforts others have made. Reactionary thinking is as old as our presence on this planet. Reactionary thinking has gone a long way in holding back human potential. So,,the next time you’re wondering why it seems nothing ever changes, remember that Reactionaries are a powerful group, huddled in their corners, afraid of progress. 1. Reach – how many folks can receive your message. That’s how it works. Simple, easy. Trump did it. Reactionaries do what they do best. How much preparation is too much? How many warnings are too many? This can be debated. One thing that can’t be debated is that things in the area went fairly smoothly – in the big picture. Things could’ve been worse if more crowds showed up in our city. These events are rare and accurately predicting what might happen requires many assumptions and guess-work. Good perspective, Hasso. I called our Vet’s office to get a cancer prescription refilled for our dog – a day early so that it would be ready in time and I wouldn’t run out – only to discover that Albany Animal Hospital had closed for the day because of the eclipse! What a bunch of weenies! Closing business for a day because of an eclipse? That’s utterly absurd. Planners and reporters warned us before the eclipse to pick up important medications early. Many businesses closed for the day or partial day. It probably made life in our fair city easier and safer (fewer people on the roads). Have to agree with Tim – unless you had your head under a rock for the last couple months, everyone should have known about the eclipse, and planned on having important meds in stock as well as food gas, etc at least a week before JUST IN CASE the worst case scenario happened. So I don’t find fault with businesses that closed for the day, so they would put their employees through potential hardship trying to get to or from work. But, a lot people these days are feeling pretty entitled!